Sinks are donated to veterans’ outreach program. Based in Toledo, Ohio, a military outreach organization known as Heroes in Action has been lending a helping hand to veterans since 2004. Their primary concern has been for the practical needs of local military families; those simple concerns which usually slip through the cracks of conventional assistance. Recently, one of the supporters of this cause, Mr. Tim Gruber of Ridge Stone Builders in Perrysburg, Ohio, decided to donate the proceeds from a house he was building to Heroes in Action. 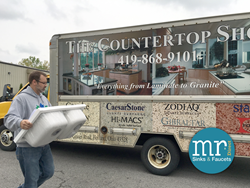 When MR Direct heard about this gesture though a local countertop fabracator The Countertop Shop, it was with great pride that they decided to assist as well. Five sinks were donated to the project, which helped to defray building costs and thus increased the profits headed to this veterans’ aid group. Heroes in Action was founded by Dawn Heisler, who holds a deep conviction to help veterans and their families get assistance when they need it. With her many volunteers, Dawn finds a way to send care packages every month to our men and women overseas -- loaded with snacks, toiletries, clothing items and always a personal letter. The organization strives to provide immediate help with everyday dilemmas being faced by vets in the community, especially the disabled. It may be getting someone to a doctor’s appointment, finding some furniture to furnish a home, or providing a bit of financial assistance to pay a utility bill. Heroes in Action works in cooperation with dozens of other organizations such as the American Red Cross, the USO, the Veterans Service Commission, and many, many, more; to accomplish any task. MR Direct plans on continuing to support this selfless organization in the future and hopes to encourage others to do the same. Whether it is a donation of money, time, or supplies to the Heroes in Action organization; rest assured it will make the life of a veteran just a little more manageable. Much more can be learned about this non-profit group by visiting their website at heroesinaction.org; or by going on Facebook.